This article needs more information. This article cannot meet a higher standard due to having little information about its subject. If you have verifiable information, please add it to this page. 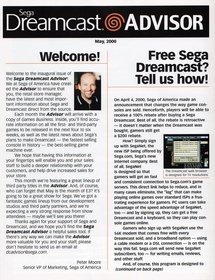 Sega Dreamcast Advisor is a supplement which was bundled with Games Business for video game retailers starting in May 2000.